Dogs sense of smell is 100,000 times strong than humans. Dogs use their noses to help find people and animals, drugs, avalanche and disaster victims, and even detect cancer. AKC tracking demonstrates the dog’s natural ability to recognize and follow a scent. Unlike obedience and rally, where the dog responds to their handler’s commands, in tracking the dog is completely in charge. The AKC has three tracking titles, each with an increased degree of difficulty. Dogs must earn the TD (Tracking Dog) title before competing for the TDX (Tracking Dog Excellent) and VST (Varible Surface Tracker) title. A CT (Champion Tracker) title is awarded to those dogs who have completed all three tracking titles – TD, TDX and VST. The TD track can vary from 440 to 500 yards long with 3-5 turns and aged from a half-hour to two hours. Tracks are plotted in open fields with uniform cover. There are no obstacles along the track. The start of the track is marked with a flag and where the first article will be. About 30 yards past the starting flag will be a second flag indicating the direction of the track. There are no other flags in the field after the first two flags. It is up to the dog to find the way to the glove or wallet at the end. The TDX track can range from 800 to 1000 yards long and can have 5-7 turns. These tracks are aged from 3-5 hours. This track has two sets of cross (diversionary) tracks and has some of the aforementioned obstacles. 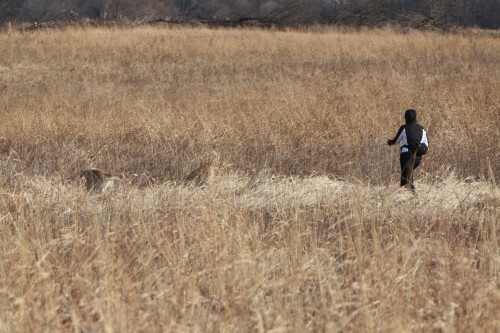 Unlike the TD test, the TDX test only has a single flag in the start and the dog must determine the direction. There are four dissimilar articles for each track, one at the start and three more on the track. the VST test ranges from 600 to 800 yards long with 4-8 turns. These tracks are aged from 3-5 hours just like the TDX test. Unlike the TD and TDX tests, which are done in open fields, the VST test contains three different surfaces with one turn on a non-vegetated surface such as concrete. This test demonstrates that dog’s ability to work in an urban environment. Tracking tests are usually held on Sunday regardless of the weather. Judges and tracklayers spend most of Saturday plotting a track for each dog. The judges draw on charts of each track indicating landmarks that will allow the locate the track with flags that mark the turns. On the morning of the test, tracklayers remove the flags while walking the track. On the morning of the test, exhibitors will get together for a “draw”, which will determine the order of dogs preform. 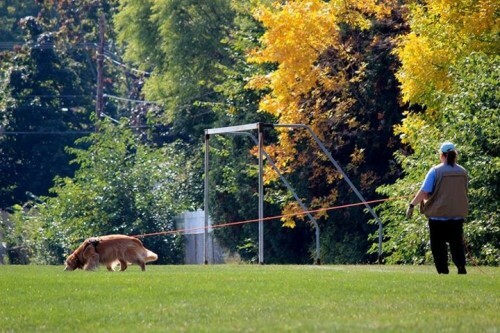 After the tracks have aged for the required time, the exhibitor puts the dog’s harness on and attaches a 20-40 foot lead and begins tracking. Dogs must follow the path of the tracklayer and find the dropped article(s). The judges and the tracklayer follow the team to determine if they are on the right path. If the dog veers off track and the judges determine that the dog cannot return to the right path, one judge will whistle which means that the dog has failed. There is no time limit as long as the dog is still working. If the dog follows the track and finds the article(s) placed on the track, that dog has passed and has earned the title for the level the team is exhibiting.